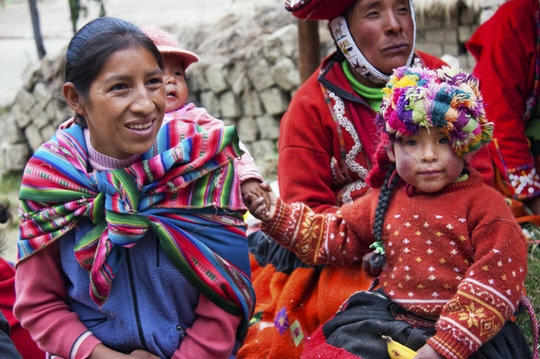 Based in the Sacred Valley of Peru, Awamaki works to empower rural female artisans by providing them with the training and market access to run successful cooperative businesses. The organization’s mission is to enable these women to generate a reliable source of income and lead their communities out of poverty. Founded in 2009 by Kennedy Leavens, Awamaki originally served a single cooperative made up of 10 women. Now, the nonprofit works with 150 women in eight cooperatives. Awamaki’s cooperative members like Florentina not only run successful businesses but also engage in sustainable tourism and community education programs. A year after the organization was created, Awamaki’s team and cooperative members were making great strides in their work. They came across an exciting opportunity, the chance for two Awamaki members to travel to Santa Fe, New Mexico, the location of America’s largest folk art market. Participation in the market could be an amazing opportunity to connect their cooperative to an expansive global market. However, the organization needed to raise funds in order to be able to participate. As Awamaki searched for a way to fund the trip, it became clear that their current income would not cover the cost. They identified crowdfunding as a way to tap into their broad network of global donors. Kennedy recalls, “We had no previous experience in online fundraising, but we figured we had nothing to lose.” By raising small amounts of money from a large number of people, Awamaki hoped to receive the financial boost they needed to achieve their goal. It was decided that crowdfunding was the solution, but how? As a small, internationally-based nonprofit, Awamaki needed a platform that would effectively rally their supporters, connect them with new donors who care about their cause, and offer them tools to help grow their organization. The Awamaki team was introduced to GlobalGiving through a friend and after learning more about the platform it was decided that GlobalGiving was the right fit. Awamaki joined GlobalGiving’s Open Challenge, which is a time-bound campaign that offers an opportunity to test out the power of crowdfunding. They built a project page on GlobalGiving that shared their story with potential donors and then spread the word about their GlobalGiving project through phone calls, emails, and social media outreach. Awamaki’s supporters were inspired to help the organization succeed in the Open Challenge due the team’s unwavering enthusiasm for their work and time sensitive nature of the Open Challenge. The Awamaki team and members were blown away by the results of their fundraising efforts on GlobalGiving. In just 30 days, Awamaki raised more than $10,000 from 379 unique donors and earned $5,000 in bonus prizes from GlobalGiving! Most importantly, two team members were able to attend the market in Santa Fe and spread the word about Awamaki. Awamaki joined GlobalGiving with the intent of funding one unique project. Today, Awamaki is a Superstar on the GlobalGiving platform and raises around $12,000 every year! As Leavens puts it, “GlobalGiving has helped our organization to grow and is now part of our core operations.” What’s their strategy for long-term success? Rallying their donor base around GlobalGiving’s Bonus Days.The Awamaki team has found that establishing a specific monetary and donor engagement goal during a time-bound campaign creates an urgency that motivates donors to give. Today, Awamaki has been able to continue to harness the power of a crowd to further their mission so that cooperative members like Florentina can continue their businesses for years to come. Fundraising isn’t easy, but GlobalGiving, a trusted crowdfunding platform can help you accelerate your efforts and help you to continue your earth-changing work!